We have now come to the end of the judging period for CrimeSpace's inaugural short story competition. From a total of thirty-two entries, the pre-judging team arrived at a shortlist that was passed on to the final panel of judges. From there, the winning three were chosen by this year's panel, made up of authors Katherine Howell, Stuart MacBride, and Sandra Ruttan, as well as Crimespree Magazine's Jon Jordan. The theme of 'Australia' proved an interesting one, in that most of the entries weren't written by Aussies. Some entrants used their internet prowess and social networking skills to flesh out the cultural details, where others settled for a mention of beer. Now, on to the winners. I'd like to thank my small team of shortlist judges--who shall remain unnamed due to the inherent dangers of judging crime fiction--for doing such a stellar job of rating the stories using my complex system. And of course I must thank my final panel of judges for their time and for risking putting their names out there on the internet for all to see. Lastly, thanks to everyone that entered the competition, especially to those who joined this crazy ship of crime fools to do so. I'm really looking forward to running the competition again next year. 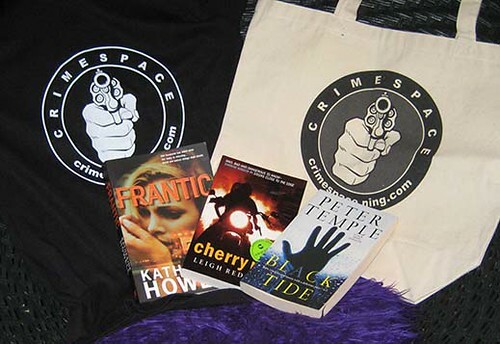 Katherine Howell's first crime thriller, FRANTIC, featuring paramedics alongside Detective Ella Marconi, was released by Pan Macmillan in Australia in May 2007. The second book in the series, THE DARKEST HOUR, will be published in May 2008. The books will also be released in Europe in the coming year. Books three and four are contracted for release in 2009 and 2010 respectively. She was a paramedic myself for fifteen years, and uses that experience to add real-life drama to her books. Jon Jordan is one of the editors and publishers of the Anthony Award winning Crimespree Magazine. He attends many different conventions and conferences each year, is the author of the Anthony nominated interview book INTERROGATIONS and is trying to find time to do a second. Stuart MacBride is a Scottish writer of crime thrillers, which are set in the "Granite City" of Aberdeen. All the places described in the book are real and can be found somewhere within Aberdeen. As of 2007, he has had three books published, all featuring Detective Sergeant Logan McRae, and starting with COLD GRANITE in 2005. Set for a 2008 release, the next book in the series will be called FLESH HOUSE. The founder of Spinetingler Magazine, Sandra Ruttan had her first newspaper column at the age of 13. She has had both non-fiction and fiction published on the web and in print, and also reviews for Spinetingler, Crimespree Magazine and Mystery Bookspot. Her first book in her police procedural series with Dorchester, WHAT BURNS WITHIN, will be released April 29, 2008 with the second book in the series scheduled for release in November 2008. For more information about Sandra visit her website.